Set in Charleston's Historic District, the Elliott House Inn is an elegant boutique inn with original hardwood floors, a tranquil cobblestoned courtyard, and airy piazzas. Set in a beautifully preserved three-story building dating back to 1861, the Elliott House Inn seamlessly blends the intimacy of bed and breakfast with the gracious hospitality and personalized of a quaint boutique hotel. The once-private residence features 26 individually decorated guest rooms and suites that capture Charleston’s luxurious residential style with delicately detailed wallpapers, rich oriental carpets, antique furnishings, and modern amenities. Guests can enjoy luxury amenities such as complimentary gourmet breakfasts every morning, cheese and wine receptions each in the evenings, a variety of concierge services and history tours. Ideally located on Queen Street in the heart of Charleston, the Elliott House Inn is a short walk from the beach and the Gibbs Museum of Art, the Dock Street Theatre, the College of Charleston, and a variety of local art galleries and restaurants. The Elliott House Inn features 26 individually decorated guest rooms and suites with elegant, residential style décor and antique, country-style furnishings, delicately detailed wallpapers, plush oriental carpets, and modern amenities. Traditional Guest Rooms are individually decorated and feature hardwood floors and original artworks, queen or king-size beds dressed in luxury linens, goose-down comforters, and hypoallergenic pillows, and en-suite bathrooms with shower/bath combinations, fresh towels, and deluxe bath amenities. Surrounding the lush and tranquil interior courtyard and designed to capture cool sea breezes, Courtyard Guest Rooms are individually decorated and furnished with hardwood floors and original artworks. These rooms offer queen or king-size beds dressed in luxury linens, goose-down comforters, and hypoallergenic pillows, and en-suite bathrooms with shower/bath combinations, fresh towels, and deluxe bath amenities. A complimentary gourmet breakfast is served in the pretty courtyard or delivered to the guest rooms every morning and includes freshly brewed coffee and tea, fresh fruit juices and fruit, baked bread, bagels, yogurt, homemade granola, and more. The Elliott House Inn offers an array of amenities, including a complimentary gourmet breakfast served every morning, cheese and wine receptions each in the evenings, room service and in-room dining from the neighboring restaurant, a 24-hour front desk, and range of concierge services. Additional services include valet laundry services, bicycles to use for exploring, and organized history tours. Established in 1670, Charleston was once the crown jewel of the Carolina Colonies and the wealthiest British city in North America. Today, the city still highlights that rich history in the cobbled streets and beautifully preserved buildings, and is full of attractions and activities to enjoy from the historic Fort Sumter, dubbed the ‘birthplace of the Civil War,’ the Magnolia Plantations and Gardens, and the Charleston City Market to the Waterfront Park, Drayton Hall and Boone Hall. 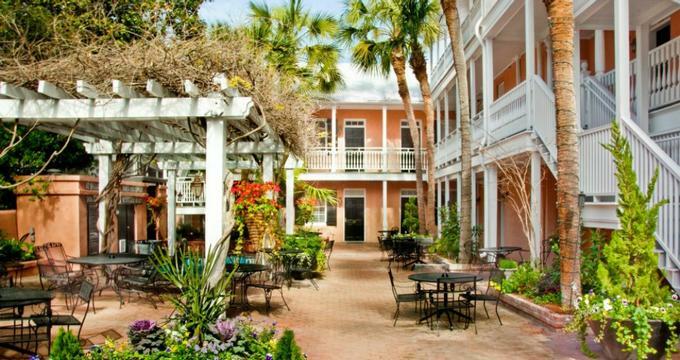 Boasting luxurious lodgings, deluxe amenities and lush gardens within walking distance of Charleston’s historic district, The Elliott House Inn offers a beautiful venue for intimate weddings, small group gatherings, and family reunions. The gardens or suites can be used for special functions, as well as the entire house, which exudes a quintessential Charleston style and 150 years of history. The Inn caters for intimate ceremonies, lavish receptions, and romantic gatherings.